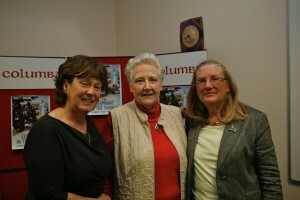 (LtoR) Gina Menzies, theologian; Mary Collins of the Vatican Commission on child safeguarding; Mary T Malone, historian and theologian. The author of a radical new book on the history of women in Christianity has claimed that Mary Magdalen was the real founder of Christianity. Mary T Malone, a retired professor of Religious Studies at St Jerome’s University in Canada, made her provocative claim at the Dublin launch of her latest book, ‘The Elephant in the Church: A Woman’s Tract for Our Times’. Addressing over 120 people, including Marie Collins, survivor of clerical abuse and a member of the Vatican’s Commission on child safeguarding, Dr Malone cited the end of the Gospel account of St Mark. “What Mark is telling us is that Jesus has lived and died and his male apostles are gone and the women are the link between the human life, death and resurrection of Jesus,” she said, noting St Peter’s denial and the absence of the other disciples at the foundational moments of Christianity. “As far as I am concerned because Mary Magdalen is there and she is the leader of the women and the men aren’t there – she is the founder of Christianity,” the historian and theologian claimed. She said the perception is that Jesus called the 12 apostles and that they put their hands on the next group [in blessing] and there is an unbroken male line through the 12 apostles down the centuries. “That is theology – it is not history; it is not what actually happened,” the retired professor of early church history in Toronto stated. According to Mary Malone, who is one of the leading authorities on the history of women in the Christian tradition, it was only when St Paul in 55AD, writing to the Corinthians, admonished ‘Let the women be silent in the churches’ that the equality between women and men of the early church began to change. “Ever since women have been forbidden to teach,” she said. She explained that though the silencing of women was initiated by Paul, the theological explanation for this silencing – that women were created second and sinned first – appears around85AD in the Letter to Timothy. “This phrase – created second, sinned first – has continued almost as a mantra down the centuries and has resulted in what is, to all intents and purposes, a men’s church. The fact that this men’s church is dying is glaringly obvious, and equally glaringly ignored,” she warned. Referring to her use of the term ‘Women Christianity’, Mary T Malone said that from the earliest New Testament days, there has been a growing volume of women’s theological reflection right down to our own day. This stretched from the women of the Gospel, the first women religious in the fourth century, the brilliant medieval women mystics, the explosion of women’s missionary, educational and healing movements after the Council of Trent, the extraordinary development of women’s ministry after the Second Vatican Council. “All of these movements were the result of women’s own ingenuity, and were, for the most part, not initiated by the male church. Add to this the brilliant growth of feminist theology since the sixties and we have a volume of entirely different theological reflection, on which to build a renewed church,” she said. Describing the history of celibacy as “very nasty to women” she recalled that when it was first introduced those women who were legally married to priests and had children, saw their marriages broken up by the church and these women and their children were sold into slavery.